In November 2005 Rohan bid farewell to the Arditti Quartet in order to pursue his own artistic vision. He now works with other artists, friends and composers around the world, bringing together music from different musical periods and different parts of the world, both eastern & western, classical and contemporary, composed music and improvisations, with players from many musical backgrounds. Although he has been more recently known as an outstanding performer of contemporary music, it was as a classical artist that he made his name as a teenager and in his twenties and thirties. Having studied cello from the age of 11 with Gaspar Cassado in Siena and Florence, he was awarded, at the age of 17, the coveted Suggia award to study in the UK with John Barbirolli and in Puerto Rico with Pablo Casals. At the invitation of Dmitri Mitropoulos, who described him in 1957 as "a rare genius... .a born musician... an amazing...cellist", Rohan was invited to give his Carnegie Hall debut in 1960 with the New York Philharmonic, playing Khatchaturian’s Cello Concerto under the baton of Stanislaw Skrowaczewski. Rohan has performed with the major orchestras of Europe, USA and the former Soviet Union with conductors such as John Barbirolli, Adrian Boult, Zubin Mehta, Seiji Ozawa and William Steinberg, as well as with composers conducting their own works such as Luciano Berio. 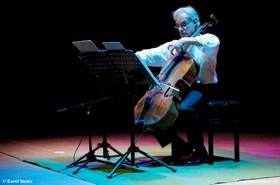 After the UK premiere of Il Ritorno degli Snovidenia for cello and orchestra Berio said of him: "Your performance of Ritorno is splendid, but besides Ritorno, your sound, your perfect intonation, your phrasing and bowing technique, make you a great performer of any music." As a result Berio wrote for him his final Sequenza, no XIV, for solo cello which, as a tribute to Rohan, includes large sections based on the rhythms of the Kandyan drum of Sri Lanka, an instrument which Rohan himself has played since his childhood in Sri Lanka. Rohan has worked with Kodaly, Shostakovich, Poulenc and Walton, as well as more recently with many leading contemporary composers such as Pousseur, Xenakis and Berio who have, amongst others, written works for him. Some of his recordings include Vivaldi's Sonatas, Rubbra's Soliloquy for cello and orchestra, Britten's Cello Suites No 1-3, John Mayer's Ragamalas & Prabhanda, Xenakis' Kottos and Carter's Figment I and II. Rohan's recordings of Berio's Sequenza XIV awaits its release on Edition Zeitklang (also including works by Xenakis, Carter, B. A. Zimmermann, Ruzicka, Gelhaar, Pröve and Steinke) and on Mode (release April 2006). Upcoming recording projects include Beethoven's Cello Sonatas and Feldman's Trio. In December 2004 Rohan was awarded an honorary D. Litt. from the University of Peradeniya , Sri Lanka. A year later, in December 2005 he received the Deshamaniya, a national honour of Sri Lanka, given by the President of Sri Lanka. Rohan's future engagements include solo recitals and concertos as well as duos with piano and duos with guitar, trios with piano and violin as well as improvisation concerts. His concerts in the immediate future will take him to cities such as Stuttgart, Berlin, Edinburgh, London, Turin, Rotterdam and Heidelberg. He will also be teaching and performing at Darmstadt in the summer of 2006. The successful collaboration with trumpet player Rajesh Mehta in the Innovative Music Meeting will also be continued. Recent reviews include the following from The Strad - of a recital at the Wigmore Hall, London on 17.10.99: "This recital marked the 40th anniversary of the great cellist's debut... with a colossal performance of the Kodály solo sonata which will stay with me as long as I live. The interpretation went far beyond virtuosity into that exalted sphere where only the most timeless music resonates…"
Of his performance of Dvorak's Cello Concerto at St. John's Smith Square in May 2004: "This was not only a moving and involving performance. It was the kind of thing one hears very seldom in our pre-packaged, cling-film modern concert life. Here was a man, renowned for his involvement with contemporary music, showing how well he comprehended every aspect of a late Romantic masterpiece... in the finale... technique was used as it should be, to aid understanding rather than to show off skill. The poignant statement of the song towards the end... was one of those moments where the clocks seem to stop. ... our rapt concentration was suspended by the merest thread. Few soloists have the courage or the means to achieve this effect, or the rhythmic control to make it work in context".